This is my "Before" pictures for expressive figure drawing. It is also my first project of this type. I know I'm absolute rubbish at it but my 30 year plan to be able to draw expressive figures by the time I'm 65 has officially started. The original plan was to wait until closer to 50 - TO TRY - because then maturity would somehow translate to talent. LOL. I don't know why I think the things I do sometimes. It's important to look at your work, no matter how rough and novice, and see the likable bits. And I look forward to the day when I can pull this out, compare it to that days work and say, "Wow! Look how far I've come!" As adults, I think it's really hard to do new things that we know we aren't going to be very good at for quite some time. It's easier to stay in our safe, accomplished comfort-zone where we know how everything works. This is the other side of the 'one idea, two ways' project I was working on. I really love how the Stabilo pencils bleed gray into the white paint. It adds interest and shading without extra effort. This is a page I did for Dina Wakely's lesson for LifeBook. It was a dresses assignment and I did one in a dress (I'll post it tomorrow) but then made another wearing pants. Seemed like a good message for a Monday morning. Lately I've been going through my art journal and finishing off any started-but-abandoned pages. Looking at them I realize that I tend to take the whole thing a little too seriously at times. Like it has to be awesome or not at all. So, I'm working on those less-than-awesome pages and accepting them for what they are; usually an experiment of some kind where I'm trying a new technique, color scheme or style. On this page I was collaging with a fairly rigid color scheme (pink and cream), colors I don't use all that much, and I used large gold mica flakes for the first time. They are really terrific but not something you control all that much. This made me crazy. I really wanted to dig around in the adhesive with a paper piercer and organize the flakes in a pleasing way. Control freak much? And while in the end there was a whole, whole lot going on here, I kinda love it. 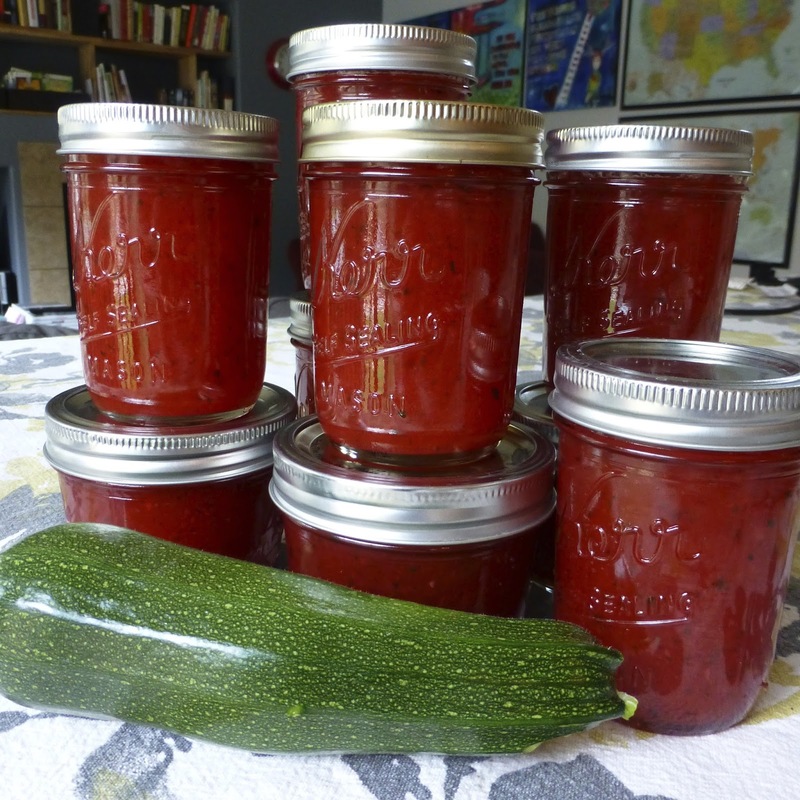 Our absolutely favorite thing this year is Zucchini Jam. 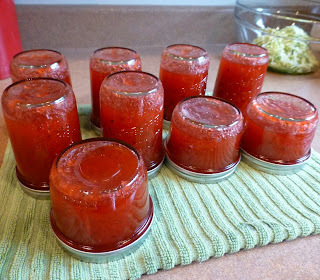 If anyone has ever gifted you with Christmas Jam or Strawberry Surprise Jam you might have already tried it and not even known. See, it's made with zucchini and crushed pineapple. Then you add whatever flavor of Jello you like to stand in for the fruit. It's spectacular and such a chameleon. It tastes like the real thing... or better! Here's how I make it. 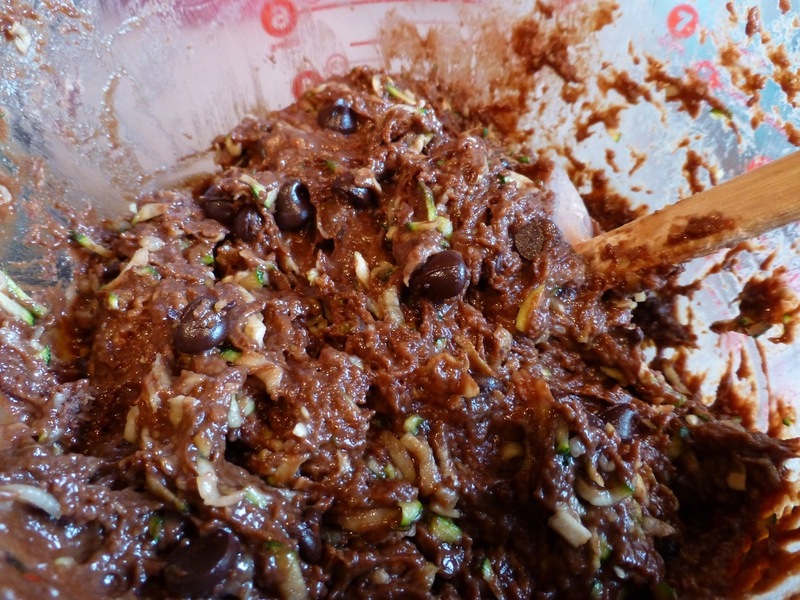 Most recipes I see on line use a ton more sugar (at least six cups) and much less lemon juice (as little as 2TBL) so I think the sweetness and tartness is a matter of taste. This jam is plenty sweet enough, IMHO. Also I've seen cook times vary all the way from three hours to ten minutes. This set of times has worked great for us. Please bear in mind that we live at 6050ft above sea level and I have no idea how that effects jam. I just know that this works. Awesomely! 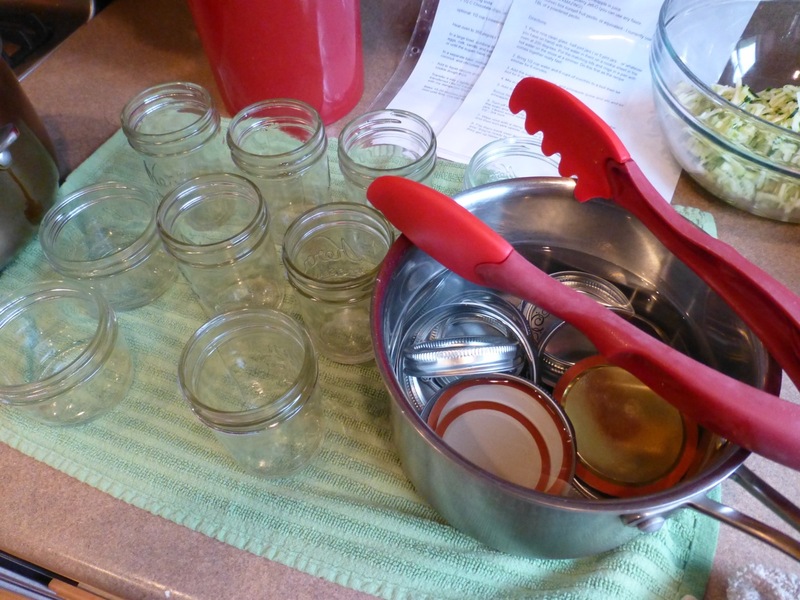 1 (2 ounce) box surejell fruit pectin or equivalent - I currently use 6 TBL of a powdered pectin. 1. 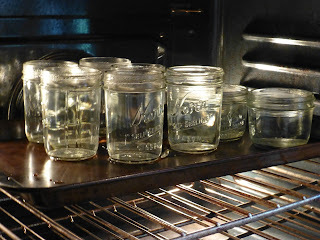 Place nine clean glass half-pint jars ( or 5 pint jars... or whatever you have on hand) with hot/boiling water in them on a cookie sheet in the oven at 200 degrees. Put the matching lids and rings in a pan with hot water on the stove at a simmer. Do this first as the cooking times really fly by and you want them to get good and hot! 2. 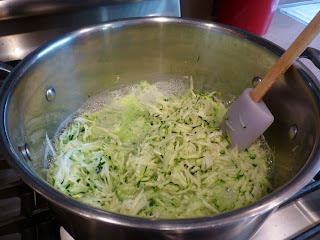 Bring 1/2 cup water and 6 cups of zucchini to a boil thel let simmer for 6 minutes. 3. 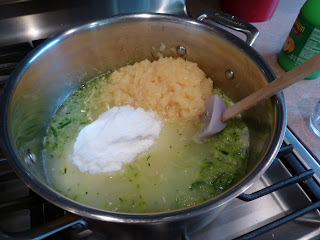 Add the sugar, lemon juice, and pineapple (juice and all) and let boil for 6 minutes. 4. 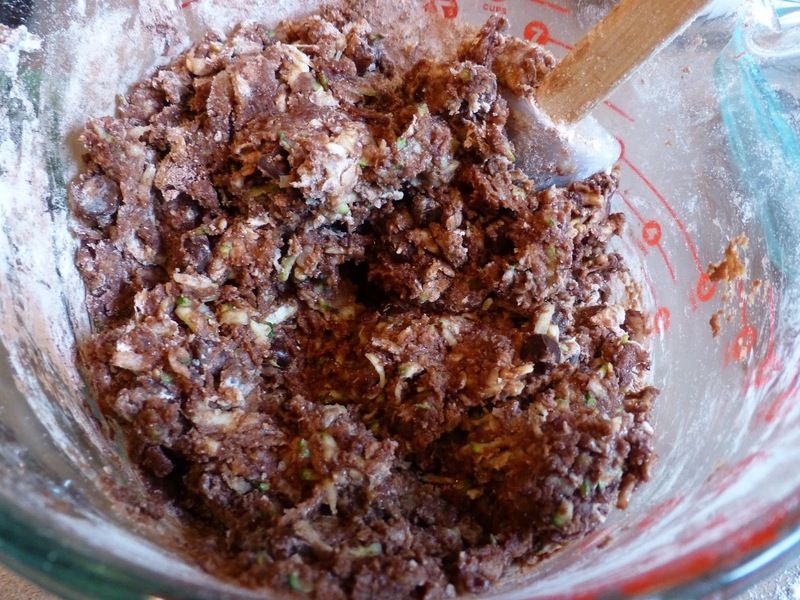 Mix in the Jello and boil 2 minutes. 5. Add Surejell and boil for 1 minute. Bonus Step: I don't like texture at all. *shudder* So I use my immersion blender at this point to mulch up all the pineapple and zucchini bits. If you like 'fruit pieces' in your jam then it's great as is. I could never handle that so I blend it. The zucchini skin gives the impression of seeds, and is very pretty, but doesn't have any discernible presence in your mouth. Be sure to take appropriate safety measures when blending molten jam. Burns hurt. Note: I added the jello and Sure-Jell, blended it and then boiled it. Sort of out of order but it seemed fine. Also I got some foam... this has never happened before so I skimmed it off. 6. 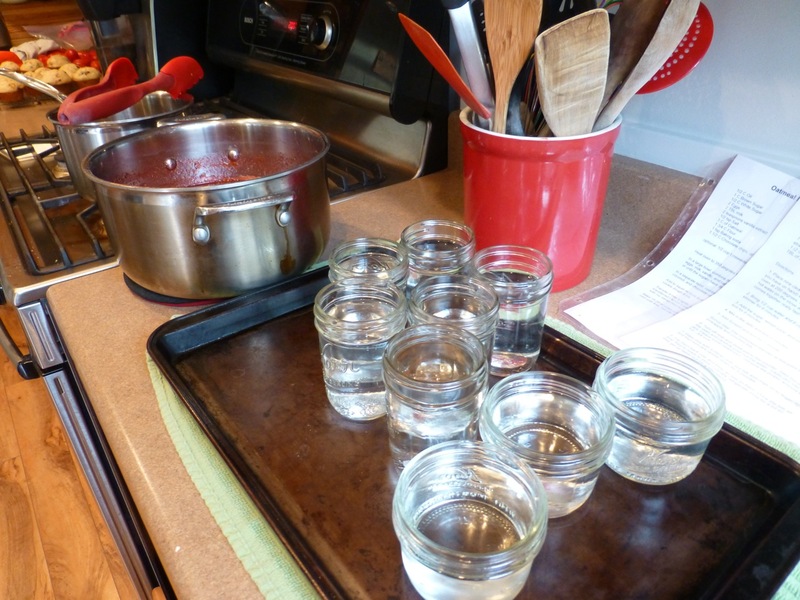 Turn off heat and move pot to the counter where you'll be filling the jars (easier to clean than the stove). 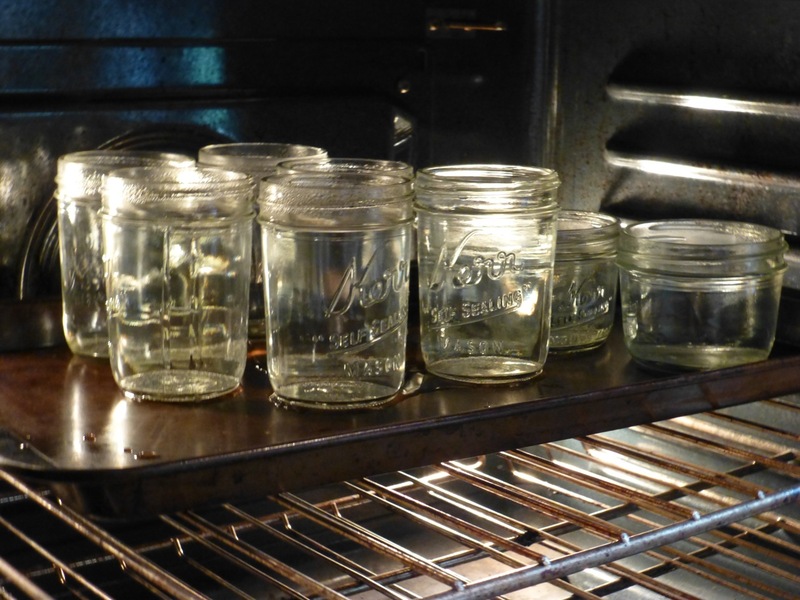 Take the jars out of the oven and carefully pour out the water. Ladle jam into the hot jars. I leave some headroom - not sure the proper amount but I live 1/2 - 3/4 inch. 7. 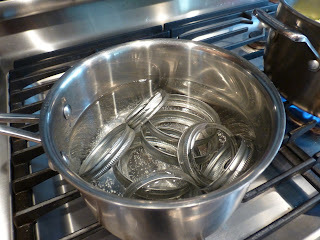 Wipe rims with a damp cloth, put lids and rings on to finger tight and then turn jars upside down for 5 minutes. 8. Flip them back over and keep an eye on them. 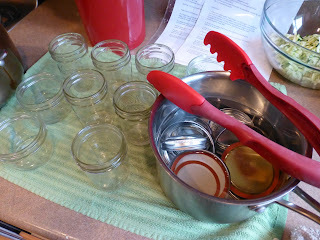 Once the lids all 'pop' they're ready to store, it can take up to 24 hours. I usually refrigerate mine for a bit after a few hours so they gel up faster but I'm a little weird. 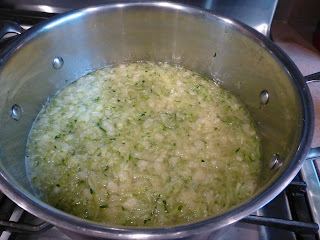 NOTE: this jam looks very runny, but after cools it sets up quite firm. 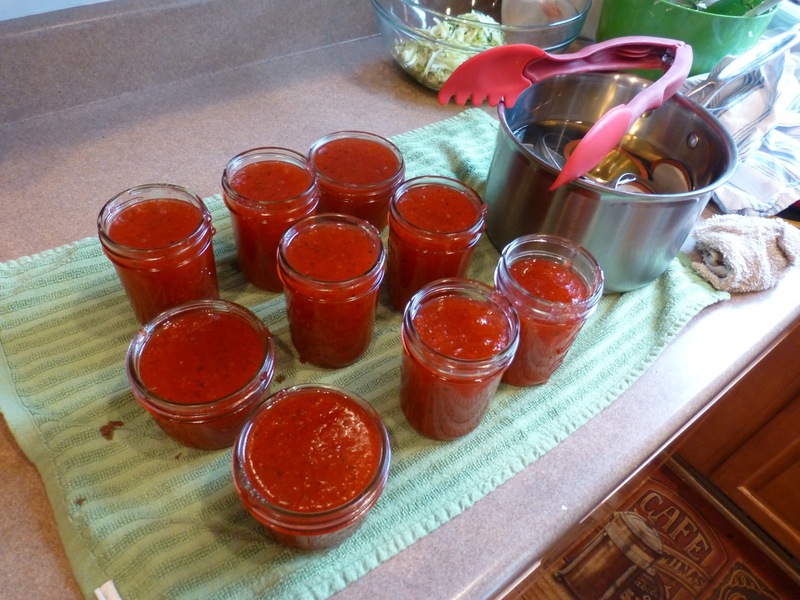 I know how solid your jam is can be regional thing and/or a matter of personal preference. If you want it runnier I'd skip the Sure jell. 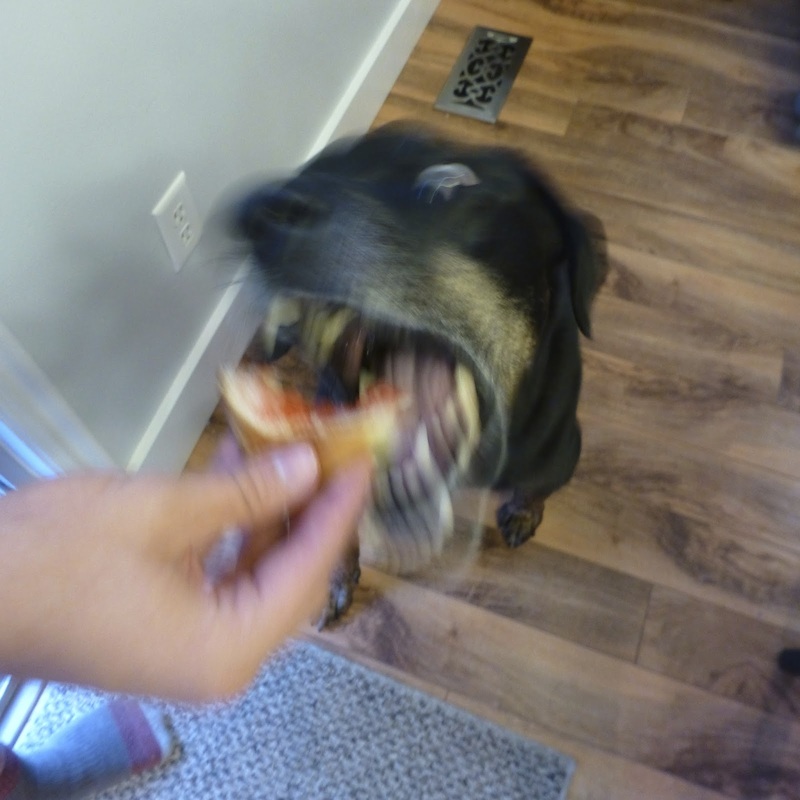 My dog loses his mind for a taste of jam and homemade bread. This page came about when I was flipping through my journal and I saw a page where I'd dabbed off stencils onto it. That is normally a perfectly fine thing to do, but the paint I was saving was dark purple, navy, black and dark brown. It was horrible. Rather than gesso over the whole thing, I decided to use my Hero Arts Neon Paint Daubers and fill in all the white spaces with bright colors. It was just the trick to bringing the whole page into a happier, more cheerful appearance. As I tend to, I stamped all my images onto journal cards with Memento Ink and then colored them simply with Copic Markers. I love the interest that stamping on journal cards adds without much effort. The results tend to be on the serendipitous side and that suits me perfectly. I'm sure you've heard of Slutty Brownies (or google it, there's a zillion hits) and the male counterpart, Man Whore Bars (which I made and will post about one of these days, I promise). They are very, very good and I don't begrudge them even a thimble full of the accolades they've received. But, for me and my tastes, I think they tip toe over the line into overkill. 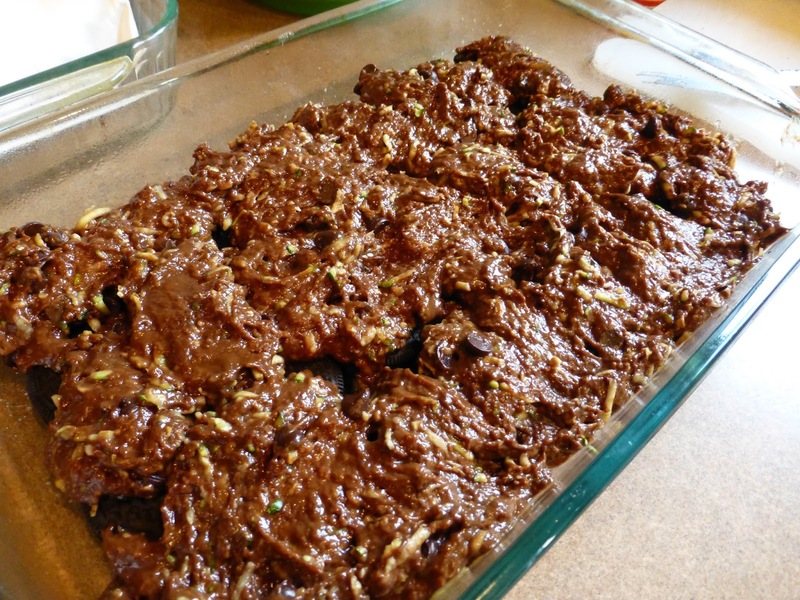 So I decided to make my own version and am calling them Reform School Brownies. See, they still have terrible boundaries and make questionable choices but they're moving towards better behavior. My husband said I am seriously unclear on the concept of reform school girls but I think he just has his mind in the gutter. 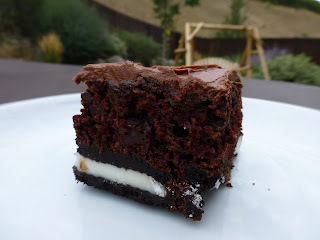 So these reformed brownies are officially our house favorite and that's saying something as I bake so much no one would be surprised if a butter delivery truck showed up at our door on a daily basis. 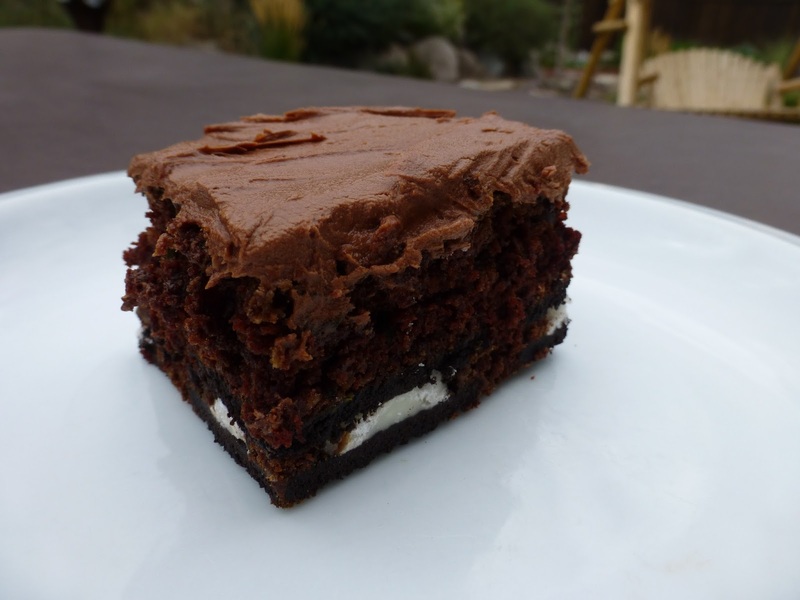 They are decadent and rich and indulgent but you don't need to flagellate yourself after having one. 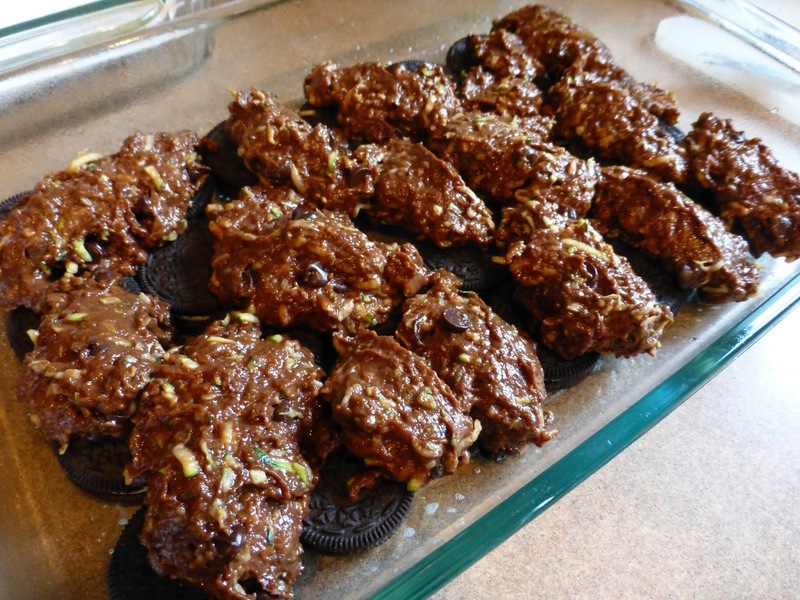 The reform part is that they are made with zucchini and whole wheat flour (if you have it) but I promise that I won't tell if you don't. (That's what he said) And I've skipped the whole chocolate chip cookie, Reese Peanut Butter Cup portion of the dish. 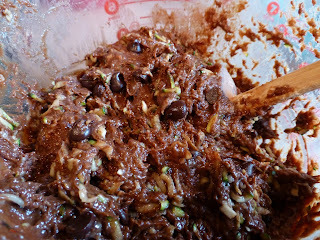 To make things even more wonderful (and they were pretty wonderful already), this is a very simple one bowl recipe with no fancy ingredients - unless you consider Oreos exotic... and then I just don't know what to say. And can I state the obvious for a second - some of you may be thinking, "but I don't have any zucchini (courgettes in the UK)." Zucchini isn't just for people with overflowing gardens or convenient farmers markets nearby. You can buy it in the produce section with other vegetables and it's super-cheap. Know it. Buy it. Love it. 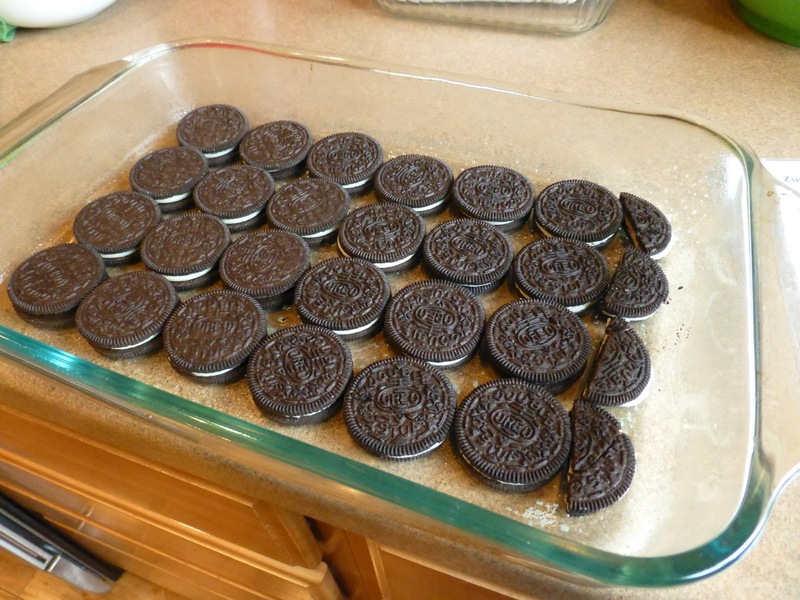 Place down a layer of oreos, cutting some if needed. 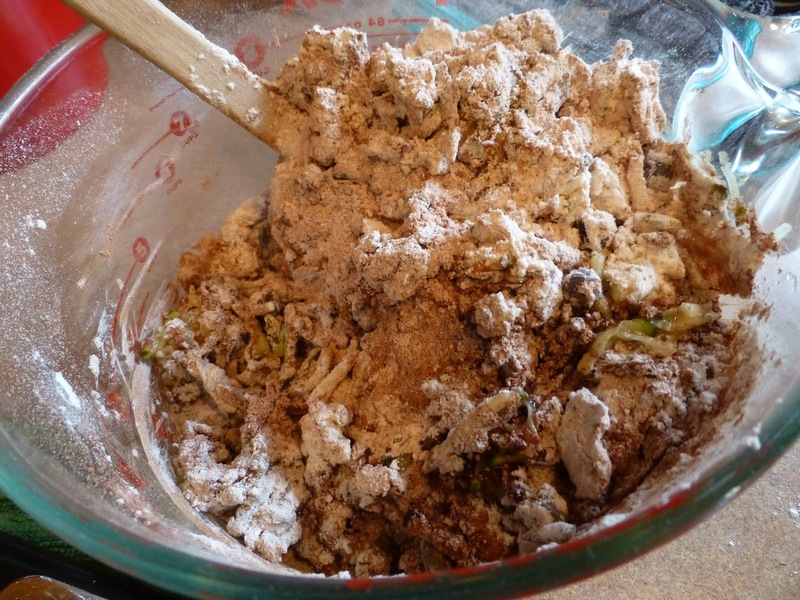 Note: I didn't feel like grinding wheat for whole wheat flour so I made it with all purpose. Works great, just a little less nutritious. Realize that these brownies are Reform School Brownies, as in still working on it, so add in some chocolate chips. Yeah, Nicole. 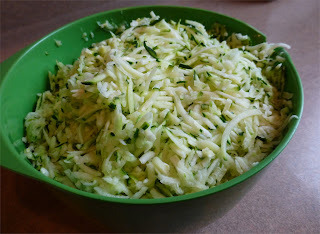 Nice bowl of dry flour clinging to zucchini. Yum! Still not decadent or appealing but it's definitely headed towards play doh consistency. Progress, right. Promise me you'll do this step. Go grab a glass of water and drink it. Or make a cup of coffee. Just a quick minute. Do it. I'll be here when you get back. 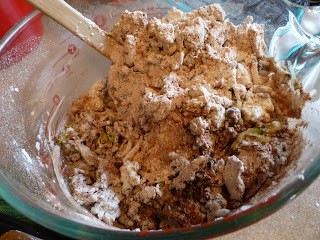 Now stir again and VOILA! 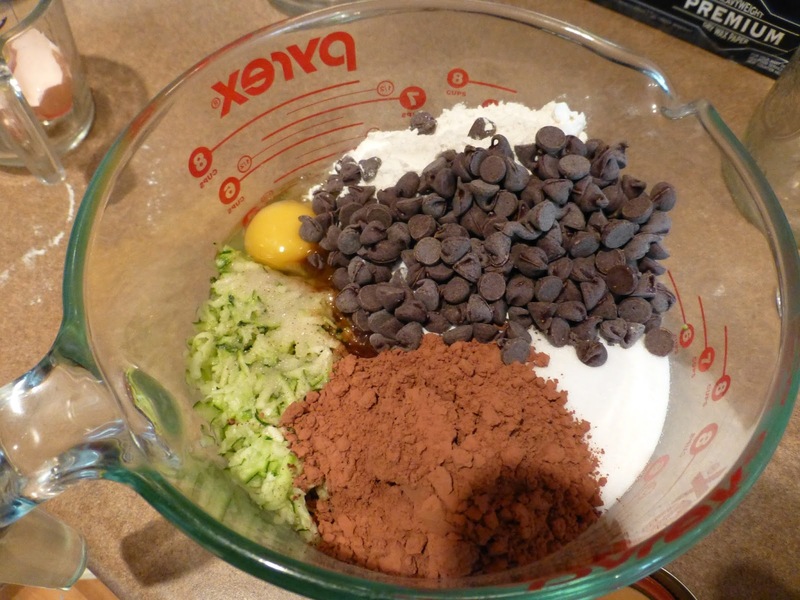 Brownie batter. 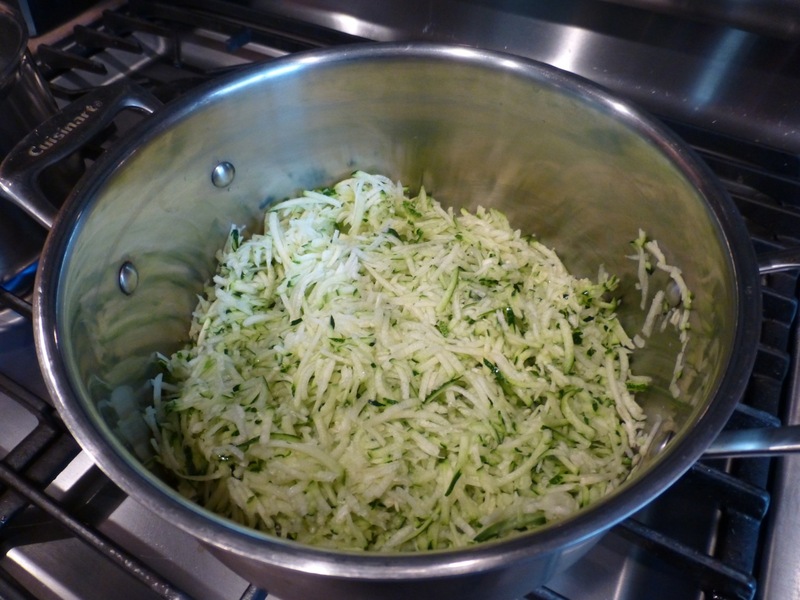 The sodium in the salt and baking soda just needed a sec to work on the zucchini so it would release it's moisture. 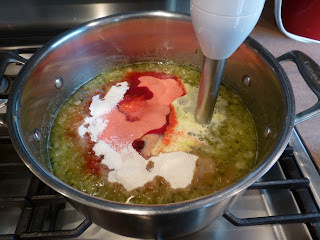 This is the sort of thing I had to figure out on my own when I first started baking and everything came out a big mess. So if it helps, Hooray! and, You're welcome. Bake 35 minutes or until brownies are set. 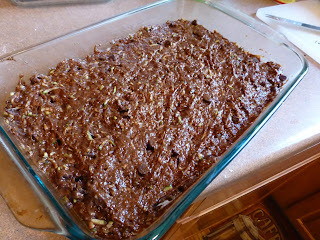 Let them cool completely - you can do this in the fridge to speed up the cooling time. I was torn between a vanilla frosting to echo the "stuff" in the Double Stuff Oreos I used, or a chocolate. Chocolate won. When making chocolate frosting always add a teeny bit of coffee, it boosts the chocolate flavor a ton, kind of like how salt improves sweetness in baked goods. 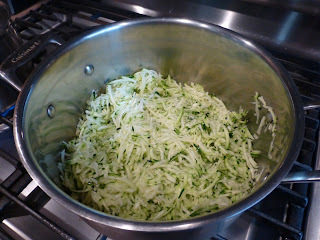 (Thanks Ina Garten for this tip). Add even more coffee if you want mocha frosting. Which I almost always do. 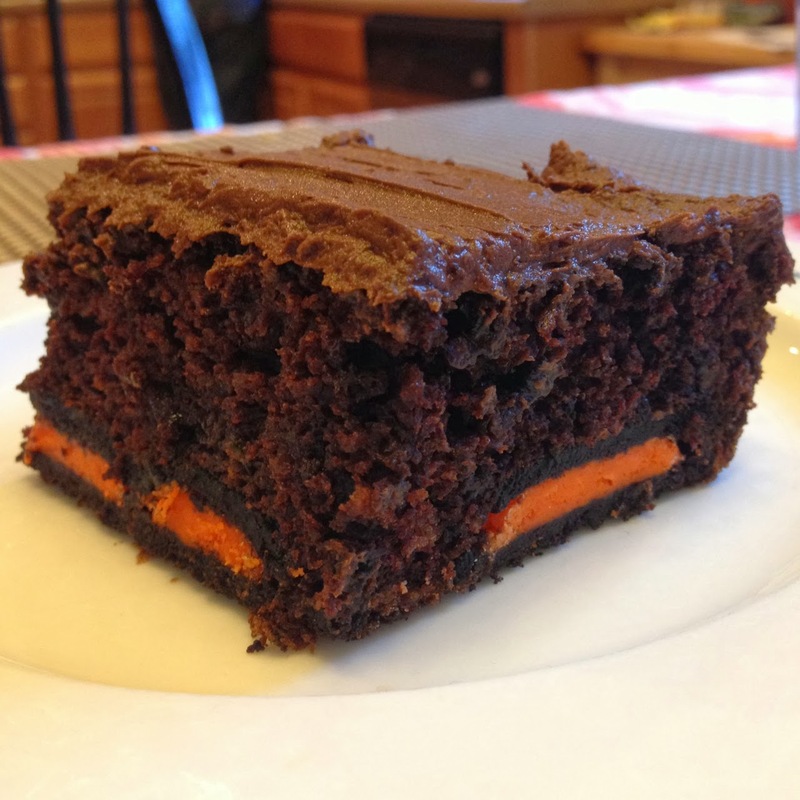 You can use canned frosting or your favorite recipe. 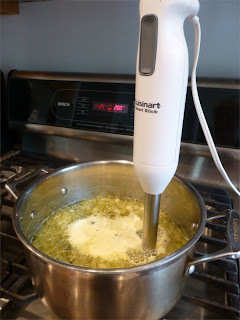 My recipe is very loose and 'to taste' but basically you take one stick of softened butter. 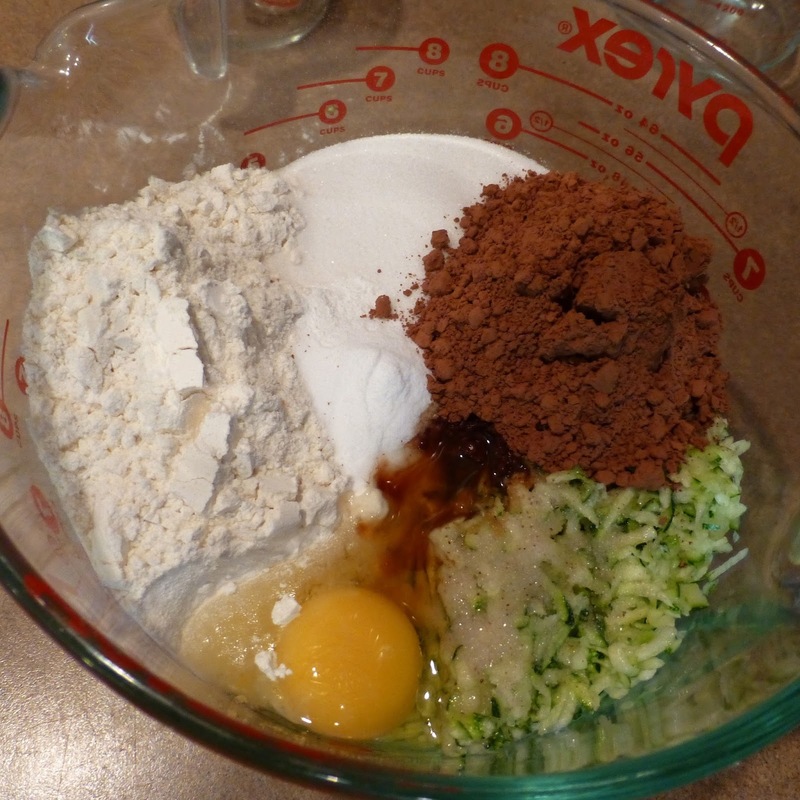 Beat in one cup of icing sugar/confectioners sugar/powdered sugar (whatever you call it where you live). Add some milk/cream/ creamer (maybe 1-2 TBL), 1 tsp of vanilla (or capful), 1/3 Cup cocoa powder (for chocolate frosting) and one more cup of confectioners sugar. Beat until smooth. Add more sugar or milk to get desired consistency. At the liquids step you can melt one TBL of instant coffee in 1 TBL of hot water and add a bit to taste. Even if you don't do coffee, try it. 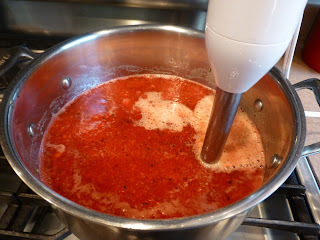 A few drops will improve the flavor dramatically. Now stand back and accept the praise. 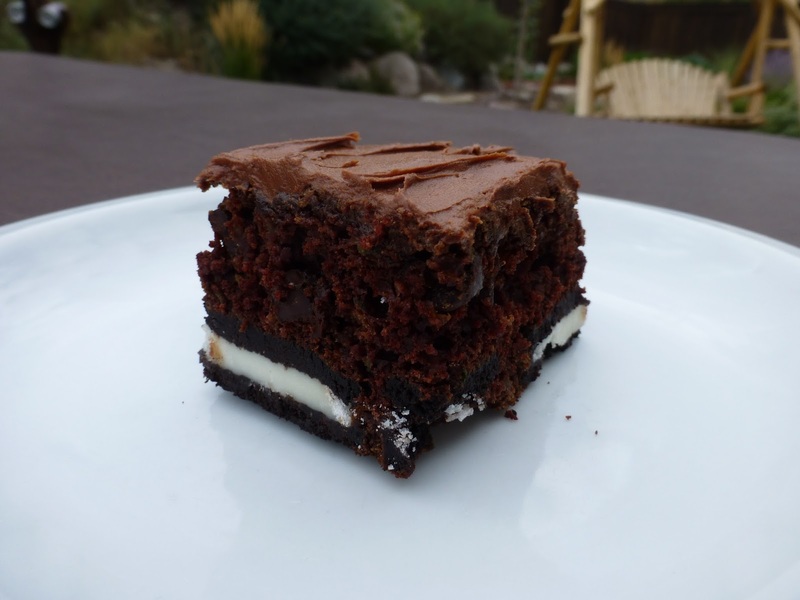 Because there will be loads of thunderous applause when those you care about enough to share these with sink their teeth into the chocolatey goodness. These are absolutely adorable when you make them with the Halloween Oreos that have orange filling.